By peptide ELISA ab1220 recognizes di methyl K9, but not unmodified K9, mono methyl K9, tri methyl K9, di methyl K27, tri methyl K27, mono methyl K4, di methyl K4 or tri methyl K4. By Western blot ab1220 is blocked by di methyl K9, but not by unmodified K9, mono methyl K9, tri methyl K9, di methyl K27, tri methyl K27, mono methyl K4, di methyl K4 or tri methyl K4. This indicates the specificity of ab1220 for di methyl K9 of Histone H3. Synthetic peptide corresponding to Human Histone H3 aa 1-100 (di methyl K9) conjugated to keyhole limpet haemocyanin (Cysteine residue). Clones were positively screened by ELISA against the immunising peptide. Clones were negatively screened against both the non-modified equivalent peptide and against a dimethylated K27 peptide. IHC-P: Human kidney tissue; Rat liver tissue. ICC/IF: HeLa cells. Flow Cytometry: Mouse embryonic stem cells. WB: HeLa whole cell lysate. Learn about ChIP assay kits, other ChIP antibodies, and more in the ChIP assay guide. 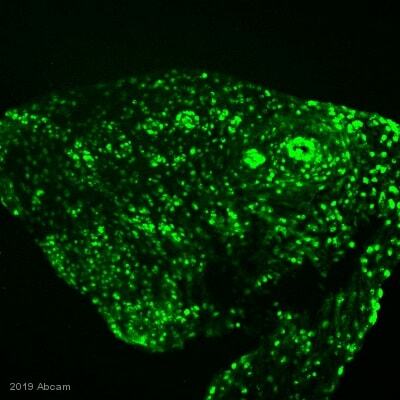 This antibody clone [mAbcam 1220] is manufactured by Abcam. Our Abpromise guarantee covers the use of ab1220 in the following tested applications. WB Use a concentration of 1 - 5 µg/ml. Detects a band of approximately 17 kDa (predicted molecular weight: 17 kDa).Can be blocked with Human Histone H3 (di methyl K9) peptide (ab1772). ELISA Use a concentration of 1 - 0.00025 µg/ml. when testing with immunogen peptide. ChIP Use 2-4 µg for 25 µg of chromatin. ChIP - Anti-Histone H3 (di methyl K9) antibody [mAbcam 1220] - ChIP Grade (ab1220)Image from Alarcon V et al., Sci Rep 13(6), Fig 4. Doi: 10.1038/srep25901. Alarcon V et al investigates the effects of pargyline due to inhibition of LSD1. Levels of LSD1 protein were reduced using siRNA (siLSD1). Cells were treated with and without siLSD1 and incubated for 24 hours before transfection of HBV genome (A). Western blot analysis shows the reduction of LSD1 after treatment. Covalent post-translational modifications on Histone H3 was determined by ChIP using ab1220 as one of the specific antibodies (C-G). HBV cccDNA and cytoplasmic levels were determined by qPCR (H). Immunocytochemistry/ Immunofluorescence - Anti-Histone H3 (di methyl K9) antibody [mAbcam 1220] - ChIP Grade (ab1220)This image is courtesy of Mr Mark Rochman by Abreview. ab1220 staining Histone H3 (di methyl K9) in MEFs SV40 transformed by ICC/IF (Immunocytochemistry/immunofluorescence). Cells were fixed with PFA, permeabilized with 0.2% Triton X-100 in PBS and blocked with 3% BSA for 1 hour at 21°C. Samples were incubated with primary antibody (1/200) for 1 hour at 21°C. A Cy3® conjugated Goat anti-mouse was used as the secondary antibody. 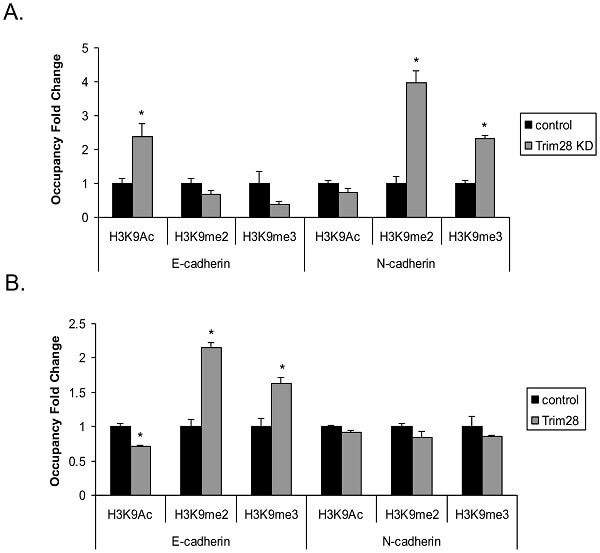 Chromatin was prepared from U2OS cells according to the Abcam X-ChIP protocol. Cells were fixed with formaldehyde for 10min. 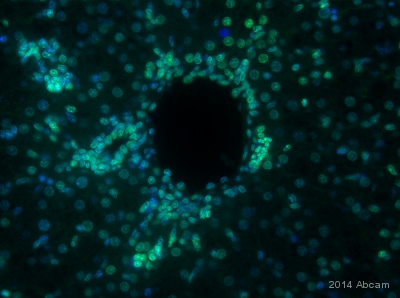 The ChIP was performed with 25µg of chromatin, 2µg of ab1220 (blue), and 20µl of Protein A/G sepharose beads. No antibody was added to the beads control (yellow). The immunoprecipitated DNA was quantified by real time PCR (Taqman approach for active and inactive loci, Sybr green approach for heterochromatic loci). Primers and probes are located in the first Kb of the transcribed region. Chen L et al investigates role of Trim 28 (Tripartite motif containing 28) in the epithelial to mesenchymal transition which is implicated in cancer metastasis. ChIP was performed using ab1220. ChIP assay was performed in Trim 28 knockdown A549 cells and control (A). ChIP assay was performed in control and Trim28 expressed in A549 cells (B). Western blot - Anti-Histone H3 (di methyl K9) antibody [mAbcam 1220] - ChIP Grade (ab1220)This image is courtesy of an anonymous abreview. Immunocytochemistry/ Immunofluorescence - Anti-Histone H3 (di methyl K9) antibody [mAbcam 1220] - ChIP Grade (ab1220)This image is courtesy of an AbReview submitted by Maki Asami. Immunocytochemistry/Immunofluorescence analysis of 1 cell mouse embryo labeling Histone H3 with ab1220 at a dilution of 1/50. Cells were fixed with formaldehyde. Blocking was performed wtih 5% serum for 30 minutes at 37°C. An Alexa Fluor®488 conjugated monoclonal mouse IgG was used as the secondary antibody. ab1220 staining human kidney sections by IHC-P using EXPOSE IHC detection kit (ab80436). Formalin fixed paraffin embedded tissue sections were pre-treated using heat mediated antigen retrieval (using a pressure cooker) with sodium citrate buffer (pH6) for 30 mins. The section was incubated with ab1220, 5µg/ml, for 1 hour at room temperature. DAB was used as the chromogen and the section was counterstained with haematoxylin and mounted with DPX. ELISA using ab1220 at varying antibody concentrations. This indicates the specificity of ab1220 for di methyl K9 of Histone H3. All blocking and antibody incubation steps were done with 5% milk in 20mM Tris-HCL, and0.1% TWEEN-20. ab1220 staining Histone H3 (di methyl K9) in Mouse Tissue sections (Liver, P5) by Immunohistochemistry (IHC-P - paraformaldehyde-fixed, paraffin-embedded sections). Tissue was fixed with paraformaldehyde and blocked with 5% BSA for 1 hour at 25°C; antigen retrieval was by heat mediation in a citrate buffer. Samples were incubated with primary antibody (1/100 in PBS/Triton 0,05%) for 3 hours at 25°C. An Alexa Fluor® 488 conjugated Goat anti-mouse (1/250) was used as the secondary antibody. 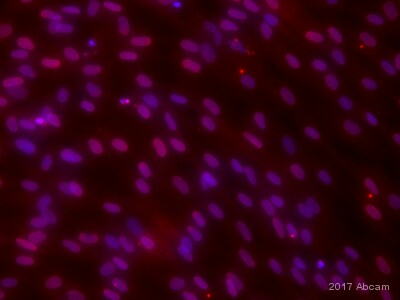 ab1220 staining mouse embryonic stem cells by flow cytometry (gated on all living cells). The cells were trypsinized and stained with the antibody at 1ug/1.5 x 105 cells in a permeabilization buffer. A Cy3® conjugated goat anti-mouse antibody was used as the secondary.